Award winning Aberdeenshire distillery GlenDronach, has announced the launch of three new single malt expressions. 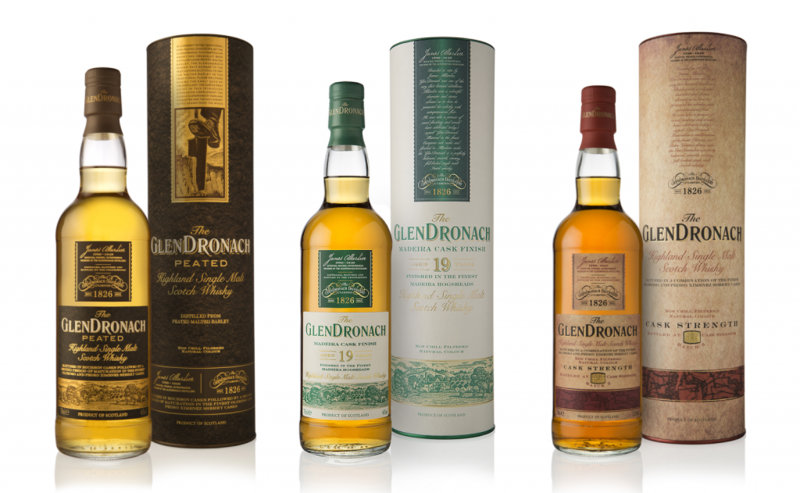 The three new releases comprise of: GlenDronach Peated (46% ABV) – GlenDronach 19 Year Old Madeira Cask Finish (46% ABV) and GlenDronach Cask Strength Batch 5 (55.3% ABV). GlenDronach Peated was distilled using peated malted barley, then was first matured in bourbon casks followed by a second period of maturation in Oloroso and Pedro Ximenez sherry casks. GlenDronach 19 Year Old Madeira Cask Finish, was initially matured in European oak casks and then finished its maturation in a very small batch of Madeira hogshead casks. GlenDronach Cask Strength Batch 5, was matured in a combination of Oloroso and Pedro Ximenez sherry casks. All three new releases will be available later this month from specialist retailers for the following RRP’s: GlenDronach Peated £38.99, GlenDronach 19 Year Old Madeira Cask Finish £76.99 and GlenDronach Cask Strength Batch 5 £55.99.